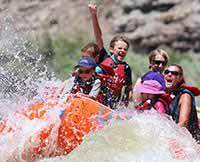 Our family completed a Green River rafting trip with a 2-night stay at Red Cliffs Adventure Ranch the end of June - it was the perfect choice. Our guides: Sam, Sarah and Spencer made this an unbelievable experience for both my children and us. Our family rates this our best trip ever!